Sting, Idina Menzel and the cast of "Sesame Street" will be among the stars celebrating at Macy's Thanksgiving Day Parade. Macy's announced Monday that Kiss, Meghan Trainor, Quvenzhane Wallis and Renee Fleming also will be part of the lineup on Nov. 27. The special will air at 9 a.m. EST on NBC. 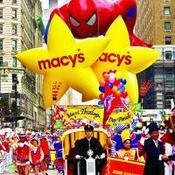 Macy's says more than 8,000 people will participate in the event.